And Chris McCandless quoted in the film, Into The Wild, that “careers are a twentieth century invention and I don’t want one!” With these two quotes in mind, I will carry on experiencing life without conforming to people ‘s expectations. It has amused me (and irritated me, too) that in Germany and in England the first question that people ask me is “so, what do you do?” I have come up with all sorts of amusing answers to that question since I gave up my “career”. To me, it is ridiculous that a career (probably producing consumerist-tat that no-one needs, or working in a brain cell-killing office job) is seen as the benchmark in monitoring human worthiness. Because I live without much money, two things are essential to me: hitchhiking and dumpster diving (or skipping). I started hitchhiking because I wanted to travel but didn’t have any money. The more miles I travel this way, the more I would recommend it. My English friends keep telling me to stop hitchhiking, that it is too dangerous. But none of my friends have ever hitchhiked, or know any hitchhikers, so how do they form this opinion? Through stories in the media? We live so cut off from each other nowadays. We are taught to fear each other, to distrust, to keep ourselves to ourselves. In non-Western countries it is common to hitchhike, to chat to the stranger next to you. How likely is it that I will be picked up by a murderer? It is far more likely that I will be picked up by someone kind, who wants to help out a stranger. I am not saying that hitchhiking is without risks. But what non-hitchhikers don’t realise is that we hitchhikers do take precautions. We don’t just get into ANY car. I would never get into a car alone with two men, for example [Edit: being more experienced, I now get into cars with more than one man, but always follow my first gut instinct]. And most of the time we are not sticking our thumbs out on the road, but actually asking for rides at petrol stations, where we can take a look at our drivers before approaching them. These drivers are surprised at being asked, and aren’t usually looking for prey to kill whilst paying for their petrol and purchasing a Ginsters pasty! As most people know, in England I was very misanthropic. Hitchhiking has given me a faith in humans that was cynically driven out of me in London. And I would like to think that I give something back to my drivers, too. A lot of the time I am the very first hitchhiker that someone has agreed to take. They are sometimes nervous when they take me. (One woman told me that she had called her boyfriend to say that she was taking a hitchhiker, and that if he didn’t hear from her in an hour, to call the police!) Hitchhikers can help to build up a sense of trust between people. Some of my drivers have even said to me that they will try hitchhiking themselves! Most drivers think I am younger than my age, which usually works in my favour in getting a lift. It does baffle me when drivers, who are roughly my age, say to me, “I wish I could have done this when I was your age”. As if adventure ends at thirty. As if dreams are redundant at thirty. Also, I started dumpster diving about a year ago. For those who don’t know, dumpster diving is where you get your food (and other items) from supermarket bins. 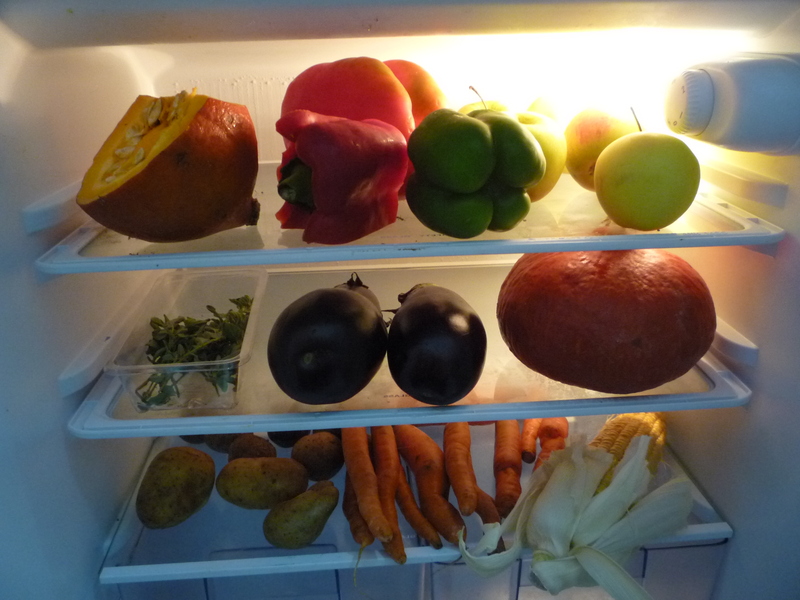 Supermarkets waste ridiculous amounts of perfect food every day. So dumpster divers retrieve this food and eat it! Millions of tons of food are wasted in the UK every year. I retrieve bananas from the South America – think about the miles that food has travelled – the impact on the environment – only to end up in a bin. Lastly, the mighty John Pilger has made this documentary about the British media…..don’t believe the news you read or watch. How odd, I’m trying to find time to start my own blog too – if I do it will be at the address I’ve just given. 1. Skipping! God, it’s so long since I did that – road protesting in the early nineties was fuelled entirely from what we could get at the markets or the skips (veggies for the protesters – meat for the dogs). They started sealing the skips and locking them in sheds… apparently having unwanted food available means the profit at supermarkets starts looking a bit unearned. Me: “Ah, go on, I’m sure you won’t baffle me”. “I’m a pest controller, the boot is full of poison. I kill rats for a living”. Good luck! See you in a couple of weeks! I think dumpster diving is still easy in the UK. Lots of supermarkets lock their bins, or use food compactors, but lots don’t. Go on http://trashwiki.org/en/England and check for supermarkets where you can dumpster dive. There probably won’t be any listed for Faversham! But you can be the first to add some. I added three supermarkets onto the Berlin page. I don’t dumpster-dive anymore for a number of reasons. Most of which you will dismiss as me being a wimp – so lets deal with those first. 2. England is an Orwellian wonderland of CCTV and grumpy minimum wage security guards. I don’t want to take food which I can afford when I know there’s people out there who could do with it more than me. If I were hungry, or skint, I’d be in there like a shot – but I’m neither of those things and feel it would be unfair to take advantage of this type of free food if I don’t need it. Ha! well, it can be quite physical, but it depends where you dumpster dive! I think Germany and the UK have similar (ridiculous) laws on trespassing and stealing when taking food from the bins. I won’t let that stop me. I actually love the randomness of it…I never know what varieties of food I will eat, week in week out. For the last two months I have been eating LOTS of pumpkins! And sometimes I have to look up on the internet what kind of exotic fruit or veg I have acquired! I would agree that people who are poor and hungry need the food before you. But going through bins is so frowned upon in England that I bet nobody looks in the supermarket bins near you. And even if they do, there is probably enough for everyone. Trashwiki.org is great because through it I have told other people where to salvage food. It made me feel guilty, knowing that there was MORE food than I could eat myself sitting in the bins, and that nobody knew about it. And that food was all organic. Much better than the Tesco rubbish people live on. And if the food is sitting there, and nobody eats it, and then you (as in, people in general) go into the supermarket and give them your custom, you are supporting the supermarket’s exploitation of farmers, of animals, of the environment. As a worker on the Taste The Waste video observes, vegetables from Kenya travelled 10,000km to end up in a bin, when there are people in that country who don’t have enough to eat. Our food system is completely fucked up. Shop locally where possible! YES! FORAGING! Please take me when I am back in England. I want to learn to identify local plants, herbs, veggies, fruits. Been meaning to read this for a while, and only just now got around to it. Good stuff. The way I see it, the role of media – and not just news-media, of course – in constructing perceptions of hitch-hiking makes for an even more interesting case study when considered as an index of socio-economic development. Where I think you’re absolutely right in the way you describe this process in ‘developed’ European nations, it’s often quite the opposite in more ‘developing’ countries. I recall some South African friends of mine, for instance, engaging in some gallows humour when I showed them the part in my Cape Town tourist information guide (or whatever it was) where it extolled the safety of hitch-hiking in their home city. I’ve heard similar stories from friends from Argentina and Chile. So, where a society is commercially ‘developed’, non-commercial behaviours may be characterised (for a number of complex, not always commercial, reasons) as risky; on the flipside, where it’s in the interests of a society to seem safe, its media will in some respects privilege that imperative. I wonder if there exists a single nation on Earth the inhabitants of which have a proportionate sense of the relative safety/danger of hitch-hiking through its territory? Anyway, keep up the blog, and I’ll be in touch about maybe coming out to Berlin when I know where the heck I’m at. Pete, I think that Romania has a healthy attitude to hitchhiking. Everyone does it and everyone socialises with their drivers without thinking that they will be kidnapped. Whether this attitude to hitchhiking will change as Romanians “embrace” their EU status, we will see. (And I am certain that it will change). I am going through your album blog (if you don’t mind me calling it that). I can’t see the Top 4 on my screen? (Although I am sure that you have Robyn at number 1). Beach House at number 9??? This album keeps getting low ratings. It’s my number 1. I didn’t realise that people still go into HMV. Having said that, I will start visiting HMV again now that I know that Bill Oddie goes there. You Londoners may have Bill Oddie and Henry Kelly, but The Hoff played Berlin for New Year’s Eve. Beat that. Back to Beach House…I had the privilege of seeing them at the festival I gatecrashed in Sweden. Unfortunately I didn’t get Grizzly Bear afterwards, though I did get The National. Hey, just a quick one. Top four’s not there yet, as I’ve been a little less available to the process over the last couple of weeks (i.e. LAZY). Robyn’s there, sure, but not at number one. I do love that Beach House record, hence number nine, but it’s probably suffered a bit from having been out (leak included) for well over a year now: I did it to death in those first couple of months. Speaking of which, I was definitely into that Bright Eyes when it came out, but, then, that was four years ago…. Bright Eyes? I am confused. I sent you the link to the new free download via Spotify, just using a random Bright Eyes tune to convey the message. Didn’t you get the text? Having listened to something to death shouldn’t alter your view on how good a record it is! i wanna dumpster with you someday! Hey I have been looking for someone like you! i plan on doing just what you are and couldn’t find anyone. This post made me log into my blog from 2 years ago and post about what ill be doing if you have any tips i would be grateful have a look and let me know if its possible and thanks again !